The use of steroids and performance enhancing drugs is a very serious topic in sports such as baseball and football, and every person in the world heard about the “doping” scandal that Lance Armstrong was involved with after winning the world famous Tour de France for so many years in a row. You may be the top athlete in your sport for 10 years, but if you get caught using steroids and other performance enhancing drugs, you will be known as a cheater, and your entire career will be be looked down upon after retiring, even if you didn’t start using the drugs until that last year when you got caught. The most examples of this exist in the sport of baseball, where players are always looking for ways to hit the ball harder and further. As far as there being performance enhancing drugs to help you in the sport of competitive eating, you are out of luck. There are many jokes about marijuana helping you eat more because people say the use of it can give you the “munchies,” but having the “munchies” will not help you eat faster. You may think that it is helping you eat more while you are eating your $15 worth of Taco Bell at 3am, but the only way to eat more is through training to increase your stomach capacity. What I am referring to with the title though is different than the actual use of steroids. If all bicycle riders in the Tour de France were doping, and all professional football and baseball players were using steroids and other drugs, most people would not watch or care about those sports and activities. There would not be 100 million people watching the Super Bowl on television and their would not be thousands and thousands of people packing into a stadium for game 7 of the baseball World Series. People watch a sport because they love the game and they love following the people playing it, and also because it’s fun to watch. They would not follow their favorite sport though if everyone playing it was cheating and playing beyond their real abilities due to drugs. If people didn’t follow the sport and pay for tickets and apparel, or even watch it on television, nobody would be making any money at all. Therefore, the players taking the steroids would not be making any money either. That is the reason why I refer to dunking as the “steroids” of competitive eating. People watch food related shows because everyone eats and most people love food in some way or another. Man v Food was the Travel Channel’s most successful show ever, and tons of people tuned in to watch it every single week. They enjoyed watching host Adam Richman visit all of the different restaurants in all of the different cities around the United States and sample the foods at each place. People not only enjoyed seeing him sample the different local foods, but they also cheered him on while he was taking the food challenges. Whether he won or lost, people still tuned in the next week to watch again. With that being said, if Adam had dunked his food in liquids and ate like a slob, nobody would have watched the episodes because they would not have been fun to watch. Therefore, there would not have even been a second season, and the food challenge revolution would not be anywhere close to what it is today. People want to watch a person eat delicious food, and the food doesn’t look delicious when it is soaked in water and there is food debris all over the place. That is definitely a fact. There is only 1 real competitive eating event that people care about, and that is the Nathan’s 4th of July Hot Dog Contest on Coney Island in New York. The contest airs on ESPN and tons of people watch it on television while almost 50,000 people show up to watch it in person. Then even more people watch it once somebody uploads the footage to YouTube. As you already know, that contest does involve dunking, because that is the only way to eat over 60 hot dogs and buns in just 10 minutes. With that being said, this contest is slightly different than others because the eaters are all up on a stage while the crowd is further away, and therefore not able to see all of the hot dog debris and liquid flying everywhere. Even then, this contest happens only 1 day per year. What are competitive eating fans able to follow the other 364 days (excluding all of the many qualifier events of course)? A lot more people would follow the sport if they were not disgusted by how all the competitors eat. The main contributor to the “grossness effect” is eaters being allowed to dunk their food, rather than their table manners. There may be some people and eaters that disagree with this article, but their little wallet and bank accounts definitely do not. A person can set 100 different eating records for both speed and quantity, but if people can’t watch the eater due to his or her manners, he or she has no real promotional value, and therefore will not get paid for his or her talents. There will be no sponsors paying for that person to represent their company brand. The sport of competitive eating and food challenges will turn into a marketable sport and gain a lot more fans & followers all over the world, but not until eaters take the sport more seriously and start eating with manners and respecting the food. We are eaters, and not circus animals. A person doesn’t get paid to set Guinness World Records but they will get paid if there are tons of people watching the attempt. As an eater, before you mash up that burger or ball up that burrito and get debris all over your hands and face, remember that nobody wants to watch you do that, and that is why eaters are lucky to make over a few hundred dollars per eating event. 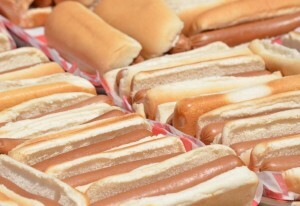 Thanks for reading “Dunking Food: The Steroids Of Competitive Eating” and for using FoodChallenges.com! !